Mexico City The pace of modernity is blistering. That’s a fact, and it’s inarguable. The internet has sped communications to a level that once again we learned last year that even the wizard inventors of Silicon Valley are unable to fully control nor are governments able to completely comprehend as they attempt to assert dominion. At the same time what many perhaps forget is how uneven these communication developments have been and continue to be. The Wall Street Journal had an interesting article recently on Amazon’s retooling to bring its empire to rural India where a new business model was required utilizing local small businesses as both delivery depots, help desks, and ordering posts that would be totally old school in Europe or North America. That lesson was also brought home to me in learning more about the famous grassroots mobilizations in the state of Oaxaca prompted by the repression of the teachers and social movements more than a dozen years ago. Oaxaca is not only the poorest state in Mexico, but also the most indigenous with sixteen different ethnic and language profiles in the area. The teachers’ union annually would hold a planton or sit-in in the zocalo or main square of the capitol, Oaxaca City, in order to raise their demands for more pay certainly, but also to demand multi-lingual education, infrastructure support, free textbooks, and other social issues. A new government in 2006 violently and militaristically attempted to end the tradition, break the union, and popular support. In a misjudgment, a peoples’ movement sprung up to not only support the movement, but to raise the myriad issues that people had with the lack of democratic government, corruption, and more. The outline of their heroic struggle is well-known. What I had not known as well until I happened to pick up and read Teaching Rebellion: Stories from the Grassroots Mobilization in Oaxaca by the CASA Collective and a team of supportive editors is the critical importance that community radio played in this epic development. Radio was both king and pawn in the back and forth between government and popular forces. When the attack began one observer after another gave testimonials to the importance of independent community radio, especially Radio Universidad at the autonomous university, which acted not only as a broadcaster, but also listening post, gathering reports from all over the state and struggle, and putting the word on the air. When the government knocked out their transmitter, protestors temporarily took over all eleven commercial radio stations, and then retained control of several calling them different names, including Radio Cacerola or Pots and Pans Radio after a women’s march that triggered some of the takeover. The government at one point established its own pirate radio in order to create disinformation which gives a sense of how critical community radio and the voice of the people was. Organizations understood as well. 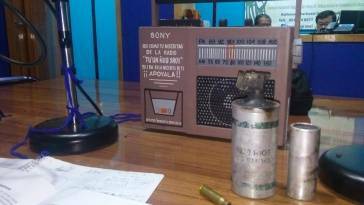 The teachers had their own Radio Planton which they lost when the police attacked. Radio, especially independent community radio, continues to be a critical communication tool bridging individual and collective voices of people to each other very directly with or without access to the internet in communities throughout the world, as true in Oaxaca in 2006 as it is everywhere today no matter how modern we might presume to be. This entry was posted in Ideas and Issues and tagged community radio, mexico, Oaxaca Rebellion by Wade. Bookmark the permalink.